An overwhelming number of incarcerated girls are victims themselves, caught in cycles of violence and abuse. The Art of Yoga Project is working to break this cycle. Our programming utilizes the Child Trauma Academy’s evidence-based Neurosequential Model of Therapeutics[v] to address the particular needs of girls in the juvenile justice system. This model guides our class sequencing by addressing emotional dysregulation, which is common in traumatized youth. 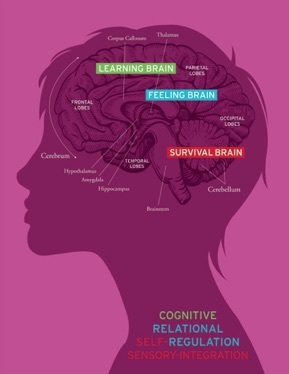 The class structure mirrors “bottom-up” brain development by first regulating the brainstem (the “survival brain”) through sensory integration and self-regulation, then the limbic system (the “feeling brain”) through relational activities, and finally the prefrontal cortex (the “learning brain”) through cognitive activities. Another way to explain this sequencing is with the “three R’s” described in the Neurosequential Model of Therapeutics —first we Regulate, then Relate then Reason. [ii] Emerson, D., Sharma, R., Chaudhry, S., and Turner, J. (2009) Trauma-Sensitive Yoga: Principles, Practice, and Research. International Journal of Yoga Therapy 19, 123-28. Trauma Center at Justice Resource Center: Brookline, MA. [v] Perry, B. D. (2009). Examining Child Maltreatment Through a Neurodevelopmental Lens: Clinical Applications of the Neurosequential Model of Therapeutics. Journal of Loss and Trauma, 14(4), 240-55. Perry, B. D. (2006). The Neurosequential Model of Therapeutics: Applying Principles of Neuroscience to Clinical Work with Traumatized and Maltreated Children. Working with Traumatized Youth in Child Welfare. Ed. Webb N. B. New York: Guilford, 27-52. Before class I was kinda nervous and worried but now I feel relaxed and calm. When I practice yoga I feel whole, I feel nothing is beyond my reach. I feel beautiful, strong and perfect, and fortunate that I am me. I see myself at a hospital wearing cartoon character scrubs with a badge with my name on it talking to a patient. I see myself as a nurse someday. When I’m in peace I’m with my family. When I think of water I think of swimming in the ocean with the dolphins. When I get angry I take it out on other people but I really don’t mean to. I overthink on why I am angry. Sometimes I just cry it out. I like to be by myself when I’m angry. Sometimes I just talk to my roommate. I’m feeling relaxed. My body feels much better with all the poses we made.